Report communication. - nexxar lab. - nexxar lab. How to improve the visibility of your digitial report? It’s somehow a paradox: companies spend hundreds – no: thousands – of hours creating their corporate reports. A lot of time and money goes into concept, copywriting, data collection, image material, photoshootings, production and project management. There is an enormous effort to create the product. But as soon as the report is published, people somehow forget about it. They spend – in comparison – very little time communicating the report. Think about it for a minute: if you consider a report not only as a statutory information document, but also as a communication vehicle, it should be in your interest to reach your audience. And fortunately there are a lot of possibilities how you can improve the visibility of your online report. Let’s start with the Corporate Website. It’s obvious that the Corporate Website is the main entry point to your digital report. So it should go without saying that your report needs to be promoted there to the maximum extent possible. For example, we always recommend to place a large header teaser on the landing page of the corporate website. 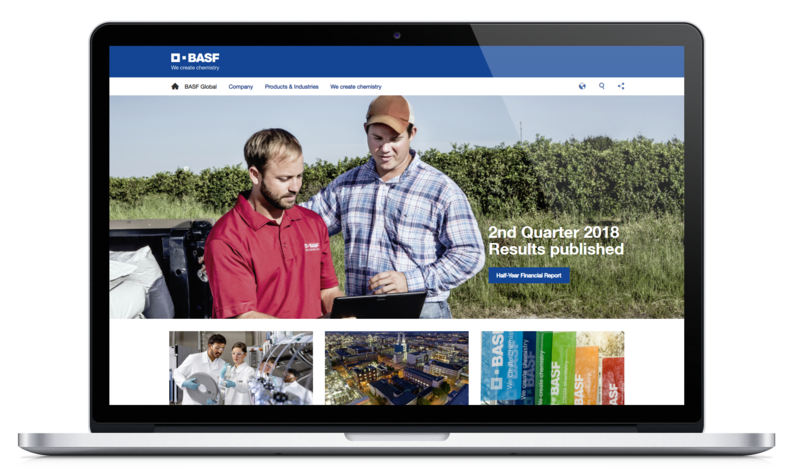 BASF is a best- practice example in this regard: the online annual report teaser on the landing page stays normally for more than 6 weeks after publication – which has a huge effect on the report statistics. Apart from on the landing page the report should of course also be found in all relevant sections of your corporate website. For example within Investor Relations section, the sustainability and the “about” section. We recommend permanent text links and graphical teasers. Most prominent would be an animated teaser GIF. Links from your corporate website (and other digital communication channels) should not only direct you to the landing page of your online annual report. Deep linking means linking to specific content pages of an annual or sustainability report. On your corporate website you will find a lot of possibilities to do exactly that. One of the direct consequences of deep linking is: you can reduce the content and the complexity of your corporate website. In our view the corporate website is the first entry-point of a company. It should offer an overview about key topics without going into too much detail and “overload” the users with too much information. For example, there is no reason why a company should place a detailed communication on their human rights policy on the corporate website if this detailed information is 1:1 also published within the online report. This would be also counter-productive, because Google would notice this as “copied content” and will see it as an attempt to manipulate the search results. You can find a lot of examples of deep linking on the BASF website. You will find hundreds of deep-links to the online report within different sections. For example the sub-page on sustainability goals. Here users will only find a short overview of the current goals, while a lot of “More-Links” refer to the specific information sources within the online report. Companies should also make use of their existing communication channels and activities. For example, they should feature the digital report in the corporate news, including the corresponding links. Often times companies publish the corporate news in the annual results but then forget to mention where to find the online report. Especially online journalists may want to refer to the source of information. The links within the corporate news can also have an SEO effect. You should also mention the report in other company-communication channels. For instance on the intranet, within newsletters or internal mailings. Just be creative. At one of our clients, for instance, the whole sustainability team uses a common e-mail signature with a link to the online sustainability report. Therefore whenever they are in contact with stakeholders they will also promote the digital report. There is no need to say that social media has become very important for corporate communication. But report communication is still a very new topic on LinkedIn, Twitter and so on. Cards are static images. Normally a combination of text and photos or visuals. So for example a Quote card could be a combination of the CEO picture and a quote from the CEO letter (see example on twitter). A fact card would on the other hand focus on one specific highlight from your corporate report (see example on Twitter) The advantage of cards is: they are very quick and easy to produce. As opposed to cards, animated GIFs are moving images. With the use of animated GIFs you can attract the attention of your stakeholders and inform them for instance on the company’s performance and key highlights. GIFs are engaging, easy to consume and work as direct links to media releases and corporate reports (see example on Twitter). Videos are more powerful than GIFs in terms of the possibilites. You can use them for example for story teasers of a short CEO video. In the best case scenario the CEO video is optimised for mobile devices – like PWC did (see example on Twitter). The short video was produced in a mobile-optimised portrait format and has a subtitle (most users will see your content without sound). 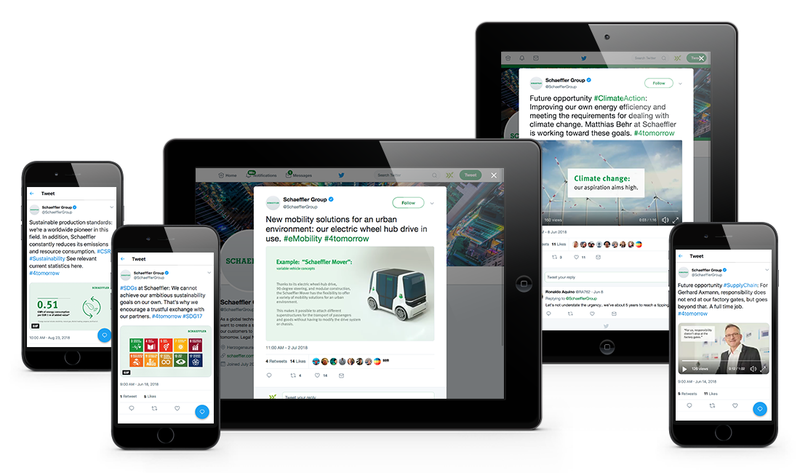 Together with the Sustainability Team from the German automotive company Schaeffler, nexxar has developed a social media communication plan for the online sustainability report 2017. The report consists of a magazine part with three stories, told from the perspective of Schaeffler employees and a “classic” reporting part with a lot of interactive features. The social media communication plan covers a time frame of almost 12 months after publication. This is a very important lesson: don’t be afraid of losing relevance. Many people think that reports are only of interest in the very recent weeks after publication. That’s simply not true. Our statistics show that there is a consistent use of a report during the year. A lot of content within your report will remain relevant for as long as your next report is published. The final social media communication plan contained more than 40 events for the publication of these assets and other postings. The publication dates had not been chosen randomly. Schaeffler was looking for suitable events which can be related to the publication. For example, our SDG GIF on “Gender Equality” was published on the official “diversity day” in May. Besides these communication activities, there is another – and very powerful – possibility to promote specific content of your digital report. Companies do this in many other fields of corporate communication, but they may not think about it in terms of reporting: We are talking about Targeted Advertising. With a Targeted Ad Campaign companies can reach those audiences who are potentially interested in specific content (e.g. magazine stories). This normally works on a pay-per-click basis. Even with low budgets, companies can potentially reach a lot of interesting stakeholders for their report. A targeted ad campaign works best if you can define a specific audience for your report – or even better: for specific parts or pages of your report. The targeting possibilities are almost endless. After you have defined the audience, the ads are shown in form of text or visual teasers – for instance on social media channels. You should keep in mind that report communication is not only about getting more clicks for the online report. This is, of course, a major goal, but there are also many other things alongside. For instance, social media assets are a communication vehicle themselves. By presenting facts from your report on social media you have already reached a target. People become more aware of these topics – no matter if they click on the teaser or not. And last but not least keep the SEO-effect in mind – every single link on the Internet that leads to your report will support its visibility on Google and other search engines.